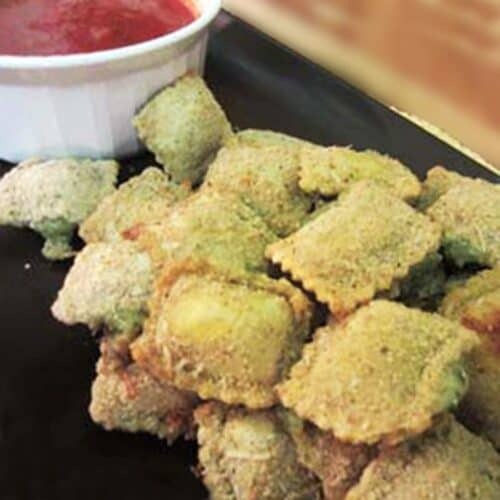 Take your favorite ravioli to the next level with this toasted ravioli appetizer. Crisp & delicious, perfect for your next party. Preheat oven to 375 degrees. Spray a large cookie sheet with Pam or other non-stick spray. Set aside. Whisk eggs and water together in small bowl. Place breadcrumbs, 1/4 cup Parmesan and pepper into large ziploc bag. Shake to combine. Take frozen ravioli and dip into egg wash then into ziploc bag with breadcrumb mixture. Shake to coat well. Place on prepared cookie sheet in a single layer. Sprinkle with additional Parmesan if desired then spray lightly with cooking spray. Bake for 12-15 minutes or until crispy and golden brown. Be careful not to overcook as they tend to dry out. Serve ravioli with marinara for dipping.